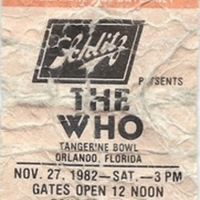 A ticket stub for a concert featuring The Who at the Tangerine Bowl, located at 1610 West Church Street in Downtown Orlando, Florida, on November 27, 1982. The ticket was $15.75, including tax, and the show began at 3 p.m., with the gates opening at noon. The opening acts were Joan Jett (b. 1958) and the Black Hearts and the B-52's. The ticket warns concert goers, "DO NOT ARRIVE EARLY." The Tangerine Bowl has been also known as Orlando Stadium, the Citrus Bowl, Florida Citrus Bowl Stadium and is currently known as Orlando Citrus Bowl Stadium. It opened in 1936 and has been home to numerous sporting and entertainment events throughout its existence. The Who is an English rock band that are considered to be one of the greatest musical influences in rock music of the 20th century. Formed in 1964, they have gone on to sell over 100 million albums and continue to be one of the highest grossing touring bands of all time. Although The Who have since reunited several times, the band announced that this 1982 tour would be their final. The Orlando show was the first of the band's second North American leg, after a four week break. Original ticket stub for the Who at the Tangerine Bowl: Private Collection of Carl Knickerbocker. Digital reproduction of original ticket stub for the Who at the Tangerine Bowl. Grantley, Steve, Alan G. Parker, and Sean Body. The Who by Numbers: The Story of The Who Through Their Music. London: Helter Skelter Pub, 2010. "The Who Concert Guide." The WhoLive.net. http://www.thewholive.net/concert/index.php?id=493& GroupID=1 (accessed February 17, 2015). “The Who Ticket Stub.” RICHES of Central Florida accessed April 23, 2019, https://richesmi.cah.ucf.edu/omeka/items/show/4768.